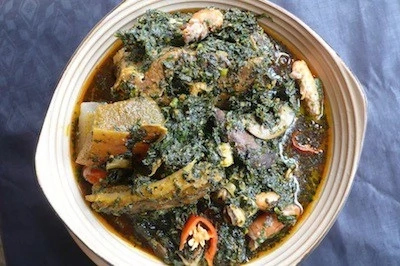 Delicious as it is, yet it is highly medicinal, edikangikong soup with tripe and spinach is version of edikangikong soup that is prepared with spinach and tripe meat gotten from cow. This delicacy is served in most hotels and other eating houses nationwide. Periwinkles are important ingredients in the cooking of edikangikong soup. It is a source of protein and are added to the meat or fish used in cooking edikangikong soup. The presence of periwinkles go a long way in making the edikangikong soup more palatable and appetizing to the eye and to the mouth. It is used not only to prepare edikangikong soup, but to prepare most local and international dishes and soups. In Imo state, periwinkle is used to prepare one of their indigenous soups called ofeowerri, which i included in my series of articles. They believe that even if you cannot afford meat or fish in the market at least with the presence of periwinkle , you can still enjoy your edikangikong soup because periwinkles are palatable and yet cheap source of meat. Snails serve as part of the assorted meats that accompany the preparation of edikangikong. It is an integral part of the soup which makes the soup more palatable. There are different types of snails available in the market today,they are the small sized brownish types and the big sized reddish ones. The reddish ones are very big in size and are more expensive in the market.They are easier to process than the smaller ones. 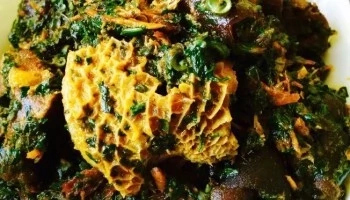 Crayfish is another important ingredient in preparing edikangikong soup, it is as well a source of protein and gives the soup that crayfish taste. Palm oil forms the base of the soup on which the other ingredients are added to. Palm oil contains plenty of vitamin A. Palm oil can be locally extracted from its nut and used directly in cooking any dish, by pouring the raw palm nuts in a clean pot and you then add a little water and place on the fire, and allow it to boil for like 30 minutes or until you start seeing the red oil settling on the surface of the water. After squeezing out the oil from the palm nuts , you then remove or sieve out the residues, which is mainly comprised of palm fibers. 5. Wash the smoked dry fish with salt and soak in slightly salted water for 5 minutes to kill any insect and loosen any sand or grit, then rinse thoroughly with lots of cold water. 6. Top and tail the periwinkle and wash thoroughly. 7. 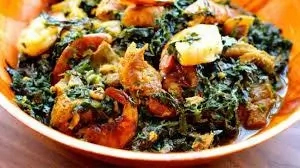 Add the snails, stock fish, dry fish, dry prawns and periwinkles to the pot of meat and cook for a further 10 minutes, adding more stock if required. 8. Finally add the cut spinach leaves and water leaf and mix it properly.